Testing cognition at the bedside and in the outpatient setting is an important part of the physical exam. Additionally, measuring changes in cognitive function can be key in monitoring response to treatment brain disorders. I have previously used a paper and pencil test called the Trail Making Test B. This test was used for measuring visual processing speed in assessing and monitoring hospitalized patients with hepatic encephalopathy. A baseline test in these patients could document the level and severity of cognitive impairment, while serial monitoring provided a measure of improvement with treatment. 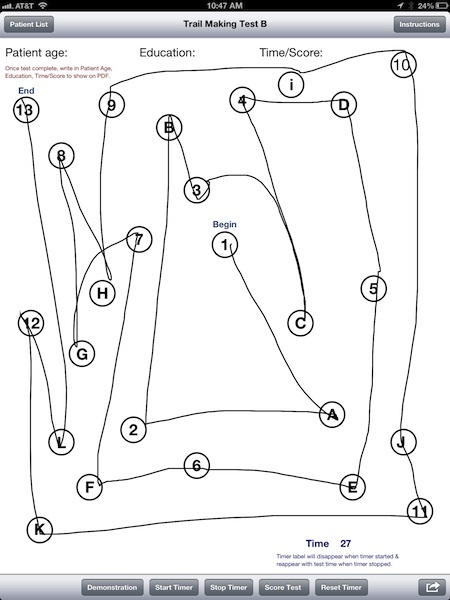 This experience with the utility of Trail Making B test in clinical settings provoked my interest in an iPad version of Trail Making Test A and B. These two tests are components of the comprehensive and time-consuming Halsted-Reitan neuropsychological battery. The test measures speed of visual processing, executive and frontal lobe function. 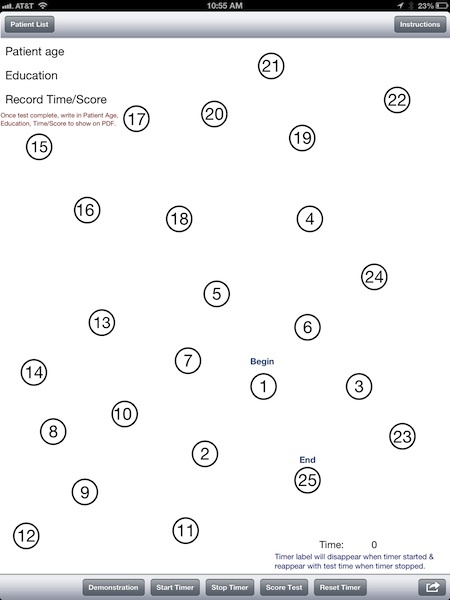 The Trail Making A app seen here opens with a series of 25 circles. To take the test, patients “connect-the-dots” with the speed and number of errors recorded. The app includes a nice Demonstration tab. This tab provides a visual aid for giving patients directions. 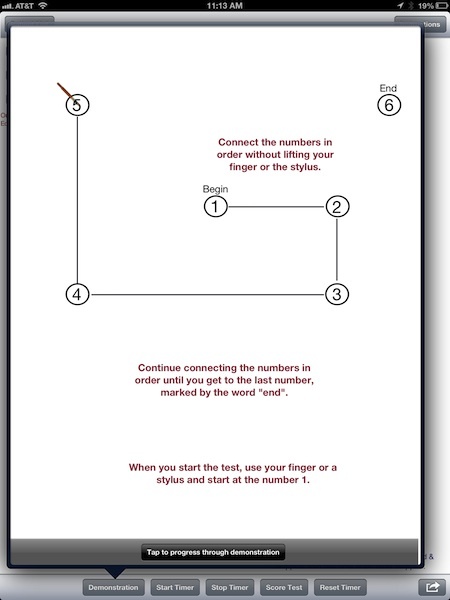 The Trail Making B test is a more complex test that requires users to alternate numbers and letters in the “connect-the-dot” task, i.e. 1,A,2,B,3C. The app includes a built-in timer button that provides a total time to completion. Test administrators are required to manually count the number of errors. Typical time for completion is about 30 seconds for Trail Making Test A and about 60 seconds for Trail Making Test B. Norms increase significantly with age. Patient norms in the 85-89 year old groups approach 3 minutes. 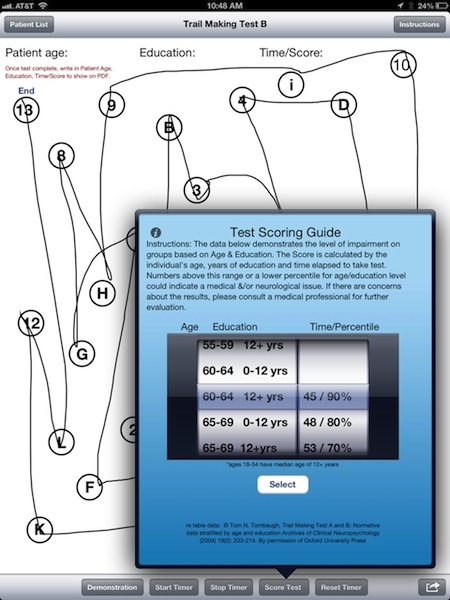 The app includes a nice test scoring button that provides percentile cutoffs by age group and level of education. The developers recommend use of a stylus to administer the test and replicate the mechanics of the paper and pencil test. Individual test results can be saved and exported via email. One question that came to mind when comparing this app with the paper and pencil test is if regular use in a hospital setting poses any infection risk to patients? This specific app is limited to the full size iPad device that is the closest to the 8.5 inch by 11 inch format of the paper and pencil version. Other Trail Making Test versions created by different developers are available for the Android platform. I am not aware of a reliability and validity study using this app compared to the paper and pencil test. However, the format closely follows the paper and pencil testing. This is a good app that at the present is limited to full-size iPad users since smartphone sized screens are too small to reliably administer the test. The app was easy to use and may be a handy app for clinicians already using an iPad for other cognitive function tests in clinical settings. Frequent hospital use would need to include attention to potential infection risk.